Note that, in the case of a file, the Volume name becomes the filename, so in the above example, you will replace the Volume-name with the name of the volume (file) you wrote. If you find yourself using bextract, you probably have done something wrong. For example, if you are trying to recover a file but are having problems, please see the Restoring When Things Go Wrongdatabase_restore section of the Restore chapter of this manual. If you wish to extract files that span several Volumes, you can specify the Volume names in the bootstrap file or you may specify the Volume names on the command line by separating them with a vertical bar. See the section above under the bls program entitled Listing Multiple Volumes for more information. The same techniques apply equally well to the bextract program or read the BootstrapBootstrapChapter chapter of this document. The bscan program can be used to re-create a database (catalog) records from the backup information written to one or more Volumes. This is normally needed only if one or more Volumes have been pruned or purged from your catalog so that the records on the Volume are no longer in the catalog, or for Volumes that you have archived. Note, if you scan in Volumes that were previously purged, you will be able to do restores from those Volumes. However, unless you modify the Job and File retention times for the Jobs that were added by scanning, the next time you run any backup Job with the same name, the records will be pruned again. Since it takes a long time to scan Volumes this can be very frustrating. With some care, bscan can also be used to synchronize your existing catalog with a Volume. Although we have never seen a case of bscan damaging a catalog, since bscan modifies your catalog, we recommend that you do a simple ASCII backup of your database before running bscan just to be sure. See Compacting Your DatabaseCompactingMySQL for the details of making a copy of your database. NOTE: before bscan can work, it needs at least a bare bones valid database. If your database exists but some records are missing because they were pruned, then you are all set. If your database was lost or destroyed, then you must first ensure that you have the SQL program running (MySQL or PostgreSQL), then you must create the Bacula database (normally named bacula), and you must create the Bacula tables using the scripts in the cats directory. This is explained in the InstallationCreateDatabase chapter of the manual. Finally, before scanning into an empty database, you must start and stop the Director with the appropriate bacula-dir.conf file so that it can create the Client and Storage records which are not stored on the Volumes. Without these records, scanning is unable to connect the Job records to the proper client. Note: bscan does not support supplying Volume names on the command line and at the same time in a bootstrap file. Please use only one or the other. You should, always try to specify the tapes in the order they are written. If you do not, any Jobs that span a volume may not be fully or properly restored. However, bscan can handle scanning tapes that are not sequential. Any incomplete records at the end of the tape will simply be ignored in that case. If you are simply repairing an existing catalog, this may be OK, but if you are creating a new catalog from scratch, it will leave your database in an incorrect state. If you do not specify all necessary Volumes on a single bscan command, bscan will not be able to correctly restore the records that span two volumes. In other words, it is much better to specify two or three volumes on a single bscan command (or in a .bsr file) rather than run bscan two or three times, each with a single volume. Note, the restoration process using bscan is not identical to the original creation of the catalog data. This is because certain data such as Client records and other non-essential data such as volume reads, volume mounts, etc is not stored on the Volume, and thus is not restored by bscan. The results of bscanning are, however, perfectly valid, and will permit restoration of any or all the files in the catalog using the normal Bacula console commands. If you are starting with an empty catalog and expecting bscan to reconstruct it, you may be a bit disappointed, but at a minimum, you must ensure that your bacula-dir.conf file is the same as what it previously was - that is, it must contain all the appropriate Client resources so that they will be recreated in your new database before running bscan. Normally when the Director starts, it will recreate any missing Client records in the catalog. Another problem you will have is that even if the Volumes (Media records) are recreated in the database, they will not have their autochanger status and slots properly set. As a result, you will need to repair that by using the update slots command. There may be other considerations as well. Rather than bscanning, you should always attempt to recover you previous catalog backup. If there is more than one volume, simply append it to the first one separating it with a vertical bar. You may need to precede the vertical bar with a forward slash escape the shell - e.g. TestVolume1\|TestVolume2. The -v option was added for verbose output (this can be omitted if desired). The -s option that tells bscan to store information in the database. The physical device name /dev/nst0 is specified after all the options. It is highly recommended that you run the test command before running your first Bacula job to ensure that the parameters you have defined for your storage device (tape drive) will permit Bacula to function properly. You only need to mount a blank tape, enter the command, and the output should be reasonably self explanatory. Please see the Tape TestingTapeTestingChapter Chapter of this manual for the details. test - test writing records and EOF marks and reading them back. fill - completely fill a volume with records, then write a few records on a second volume, and finally, both volumes will be read back. This command writes blocks containing random data, so your drive will not be able to compress the data, and thus it is a good test of the real physical capacity of your tapes. readlabel - read and dump the label on a Bacula tape. cap - list the device capabilities as defined in the configuration file and as perceived by the Storage daemon. To determine the best configuration of your tape drive, you can run the new speed command available in the btape program. Specify the Maximum File Size for this test (between 1 and 5GB). This counter is in GB. Specify the number of file to be written. The amount of data should be greater than your memory ( ). This flag permits to skip tests with constant data. This flag permits to skip tests with random data. This flag permits to skip tests with raw access. This flag permits to skip tests with Bacula block access. btape.c:1078 Test with zero data and bacula block structure. btape.c:956 Begin writing 3 files of 3.221 GB with blocks of 129024 bytes. btape.c:1090 Test with random data, should give the minimum throughput. When using compression, the random test will give your the minimum throughput of your drive . The test using constant string will give you the maximum speed of your hardware chain. (cpu, memory, scsi card, cable, drive, tape). You can change the block size in the Storage Daemon configuration file. Where you replace /home/bacula/bin with the path to your Bacula binary directory, and you replace mail.domain.com with the fully qualified name of your bsmtp (email) server, which normally listens on port 25. For more details on the substitution characters (e.g. %r) used in the above line, please see the documentation of the MailCommand in the Messages Resourcemailcommand chapter of this manual. In general, bsmtp attempts to cleanup email addresses that you specify in the from, copy, mailhost, and recipient fields, by adding the necessary and characters around the address part. However, if you include a display-name (see RFC 5332), some SMTP servers such as Exchange may not accept the message if the display-name is also included in and . As mentioned above, you must test, and if you run into this situation, you may manually add the and to the Bacula mailcommand or operatorcommand and when bsmtp is formatting an address if it already contains a or character, it will leave the address unchanged. The dbcheck program can be found in the bacula-source/src/tools directory of the source distribution. Though it is built with the make process, it is not normally "installed". If the -B option is specified, dbcheck will print out catalog information in a simple text based format. This is useful to backup it in a secure way. If you are using Mysql, dbcheck will ask you if you want to create temporary indexes to speed up orphaned Path and Filename elimination. Mostly for PostgreSQL users, we provide a pure SQL script dbcheck replacement in examples/database/dbcheck.sql that works with global queries instead of many small queries like dbcheck. Execution instructions are at the top of the script and you will need to type COMMIT at the end to validate modifications. If you are using bweb or brestore, don't eliminate orphaned Path, else you will have to rebuild brestore_pathvisibility and brestore_pathhierarchy indexes. The data-file is a filename that contains lines of data to be matched (or not) against one or more patterns. When the program is run, it will prompt you for a wild-card pattern, then apply it one line at a time against the data in the file. Each line that matches will be printed preceded by its line number. You will then be prompted again for another pattern. testfind permits listing of files using the same search engine that is used for the Include resource in Job resources. Note, much of the functionality of this program (listing of files to be included) is present in the estimate commandestimate in the Console program. The original use of testfind was to ensure that Bacula's file search engine was correct and to print some statistics on file name and path length. However, you may find it useful to see what bacula would do with a given Include resource. The testfind program can be found in the bacula-source/src/tools directory of the source distribution. Though it is built with the make process, it is not normally "installed". The cdrtools package installed on the bacula server. DVD burning is not supported by bimagemgr at this time, but both are planned for future releases. Installation from tarball: 1. Examine the Makefile and adjust it to your configuration if needed. 2. Edit config.pm to fit your configuration. 3. Do 'make install' as root. 4. Edit httpd.conf and change the Timeout value. The web server must not time out and close the connection before the burn process is finished. The exact value needed may vary depending upon your cd recorder speed and whether you are burning on the bacula server on on another machine across your network. In my case I set it to 1000 seconds. Restart httpd. 5. Make sure that cdrecord is setuid root. Installation from rpm package: 1. Install the rpm package for your platform. 2. Edit /cgi-bin/config.pm to fit your configuration. 3. Edit httpd.conf and change the Timeout value. The web server must not time out and close the connection before the burn process is finished. The exact value needed may vary depending upon your cd recorder speed and whether you are burning on the bacula server on on another machine across your network. In my case I set it to 1000 seconds. Restart httpd. 4. Make sure that cdrecord is setuid root. For bacula systems less than 1.36: 1. Edit the configuration section of config.pm to fit your configuration. 2. Run /etc/bacula/create_cdimage_table.pl from a console on your bacula server (as root) to add the CDImage table to your bacula database. Accessing the Volume files: The Volume files by default have permissions 640 and can only be read by root. The recommended approach to this is as follows (and only works if bimagemgr and apache are running on the same host as bacula. For bacula-1.34 or 1.36 installed from tarball - 1. Create a new user group bacula and add the user apache to the group for Red Hat or Mandrake systems. For SuSE systems add the user wwwrun to the bacula group. 2. Change ownership of all of your Volume files to root.bacula 3. Edit the /etc/bacula/bacula startup script and set SD_USER=root and SD_GROUP=bacula. Restart bacula. Note: step 3 should also be done in /etc/init.d/bacula-sd but released versions of this file prior to 1.36 do not support it. In that case it would be necessary after a reboot of the server to execute '/etc/bacula/bacula restart'. bimagemgr installed from rpm > 1.38.9 will add the web server user to the bacula group in a post install script. Be sure to edit the configuration information in config.pm after installation of rpm package. bimagemgr will now be able to read the Volume files but they are still not world readable. If you are running bimagemgr on another host (not recommended) then you will need to change the permissions on all of your backup volume files to 644 in order to access them via nfs share or other means. This approach should only be taken if you are sure of the security of your environment as it exposes the backup Volume files to world read. Calling the program in your web browser, e.g. http://localhost/cgi-bin/bimagemgr.pl will produce a display as shown below in Figure 1. The program will query the bacula database and display all volume files with the date last written and the date last burned to disk. If a volume needs to be burned (last written is newer than last burn date) a "Burn" button will be displayed in the rightmost column. Place a blank CDR disk in your recorder and click the "Burn" button. This will cause a pop up window as shown in Figure 2 to display the burn progress. 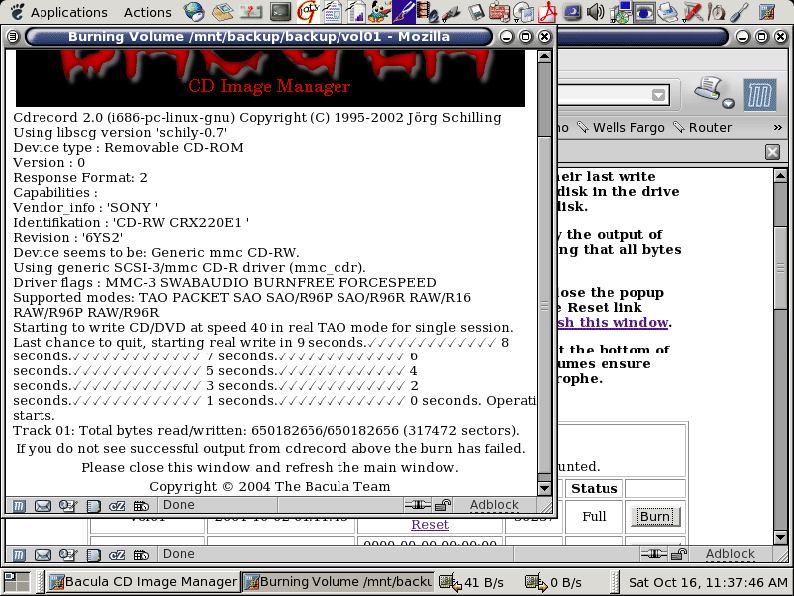 When the burn finishes the pop up window will display the results of cdrecord as shown in Figure 3. Close the pop up window and refresh the main window. The last burn date will be updated and the "Burn" button for that volume will disappear. Should you have a failed burn you can reset the last burn date of that volume by clicking its "Reset" link. In the bottom row of the main display window are two more buttons labeled "Burn Catalog" and "Blank CDRW". 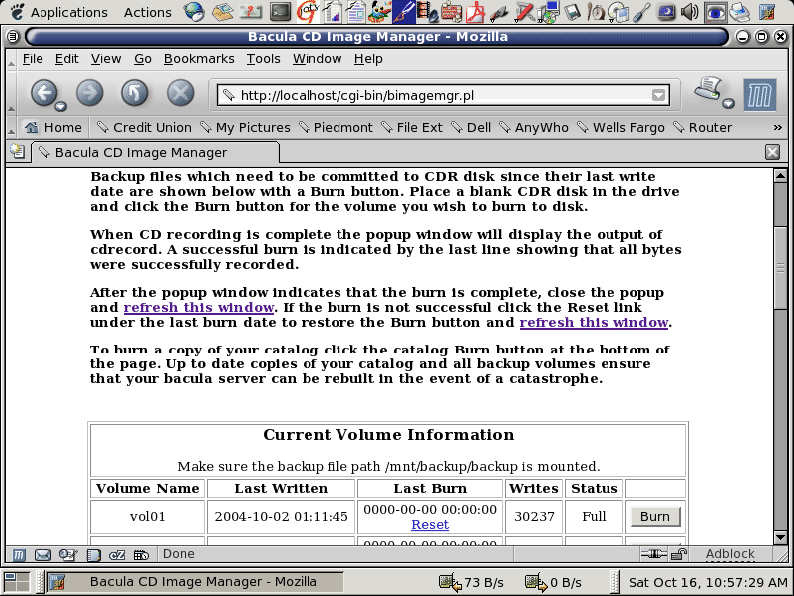 "Burn Catalog" will place a copy of your bacula catalog on a disk. If you use CDRW disks rather than CDR then "Blank CDRW" allows you to erase the disk before re-burning it. Regularly committing your backup volume files and your catalog to disk with bimagemgr ensures that you can rebuild easily in the event of some disaster on the bacula server itself.